What Is DD Form 2890C? 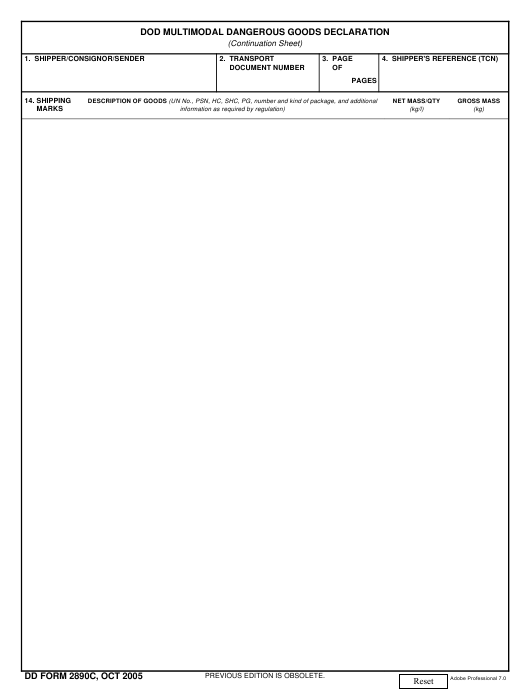 DD Form 2890C, DoD Multimodal Dangerous Goods Declaration (Continuation Sheet) is an additional page to the DD Form 2890 and is used for recording information about shipments of dangerous goods. The form mainly contains a description of the hazardous items shipped. The latest version of the form - sometimes incorrectly referred to as the DA Form 2890C - was released by the Department of Defense (DoD) in October 2005. An up-to-date DD Form 2890C fillable version is available for download and digital filing below or can be found through the Executive Services Directorate website. The form is a continuation sheet of the DD Form 2890, DoD Multimodal Dangerous Goods Declaration. The main document is used for providing information about the individual responsible for the goods, their places of loading and discharge and the details about the hazardous materials within a shipment. The continuation sheet includes five items in total. Filing instructions are similar to those of the main form. Item 1 is for providing an address and telephone number of the organization where the dangerous goods were certified. Item 2 requires a transport document number and is applicable only for ocean container shipments. The page number and the total number of pages should be indicated in Item 3. The 17-character TCN goes in Item 4. The ID number prescribed for the material. The shipping number assigned to the goods. The hazard class or division. If the corresponding subsidiary hazard label is not attached, the subsidiary hazard class or division number is not required. The packing group in Roman numerals. The digits may be preceded by letters. Additional information from the IMDG, chapter 5.4. The number and the kind of packaging. The total quantity of hazardous goods, including an indication of the unit of measurement. This does not concern the transportation by aircraft. The total net quantity for non-explosive materials is entered in a metric measure when transporting ammunition by Government Vehicle. In parentheses underneath the metric measure may also be added the U.S. measure. The activity contained in each package of the shipment. The data should be entered in the appropriate SI units, customary units may be indicated in parentheses. Abbreviations are authorized.